Stofpad 4×4 rock sliders are engineered to withstand any force that you may throw in its way. 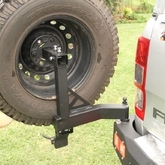 The rock sliders are bolted to the vehicle’s chassis and no modifications or welding is required. The rock sliders are powder-coated and polished stainless steel logo plates are added to finish the slider off in style. Driving a 4×4 vehicle wherever you want is one of the many advantages of having a 4×4, but most well-used 4×4 vehicles suffer from more than the average wear and tear by crawling over 4×4 obstacles, on 4×4 trails or off-road trips. 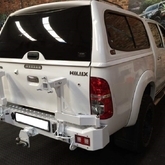 To protect a 4×4 vehicle, rock sliders or running boards are often installed to decrease the damage to the vehicle’s chassis. 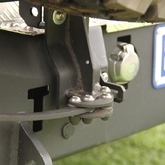 Rock sliders run along each side of the vehicle, from just behind the front wheel to just before the rear wheel, just below the level of the door sills. Rock sliders are an aftermarket accessory popular among four wheel drive vehicle owners who engage in more serious off-road driving. Contrary to rock sliders, running boards are footboards extending along the side of a vehicle to aid entry, especially into high vehicles; and are typical of vintage cars - which had much higher ground clearances than today’s vehicles. 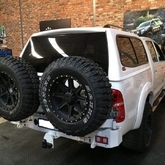 The major difference between running boards and rock sliders is that rock sliders are mounted to the chassis of your vehicle, not to the floor board. This ensures structural rigidity and allows the absorption of impact, while preventing damage to your vehicle in case of impact. Impact protection for side and bottom of vehicle. Easy access to the vehicle. Availability of jack connection points, including High-lift. Provides easy access to roof racks. Prevent damage due to doors being opened against your vehicle in parking areas. Why do I need rock sliders? 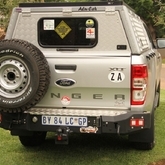 The absence of rock sliders can lead to severe and expensive damage on the side of the vehicle. 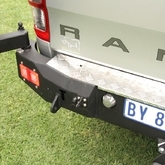 When travelling off-road, large rocks and obstacles on and off the beaten track have the potential to bend, dent, or even rupture the door sills of your vehicle. This can lead to problems with door seals and alignment, as well as the obvious visible affects. 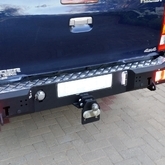 To prevent damage to the sides and underside of your vehicle, rock sliders are perfectly fitted to allow you freedom of movement while protecting your vehicle from damage on 4×4 trails or routes. 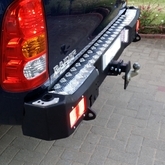 When moving over extremely rugged terrain, rock sliders can also allow your vehicle to slide over obstacles that would otherwise get caught or stuck on side steps or wheel arches. The function of a rock slider is to protect the door sills and door bottoms from damage when crossing large obstacles (such as rocks – hence the name). 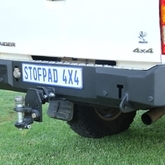 Get the protection you need for your prized 4×4 vehicle with Stofpad4x4 Rock Sliders, the best manufacturer of aftermarket 4×4 accessories. Stofpad4x4 uses rectangular tubing in the 76 x 50 x 2.5 mm size range, surrounded with a 50 x 3 mm steam pipe to form the slider bar. Each design is tailored to the intended vehicle’s length and, where required, the rectangular tubing is profiled via 3D laser to follow the shape of the vehicle. Naturally, the bigger and heavier vehicles use thicker and larger tubing. Additionally, Stofpad4x4 manufactures box type rock sliders that are completely made from laser cut and CNC bend profiles. Each vehicle’s design is tailored and unique to its specifications.